WORCESTER, MA– The Worcester Railers Hockey Club (@RailersHC), proud ECHL (@ECHL) affiliate of the New York Islanders (@NYIslanders), and Railers HC Community Relations Coordinator Paul Harris (@paulharrisjr10) officially announced today that the club nominated Connor Doherty (@dotes28) for the ECHL’s Community Service Award. Connor Doherty has been selected as a nominee for the ECHL’s Community Service Award in recognition of his commitment on being an active member of the greater Worcester community. 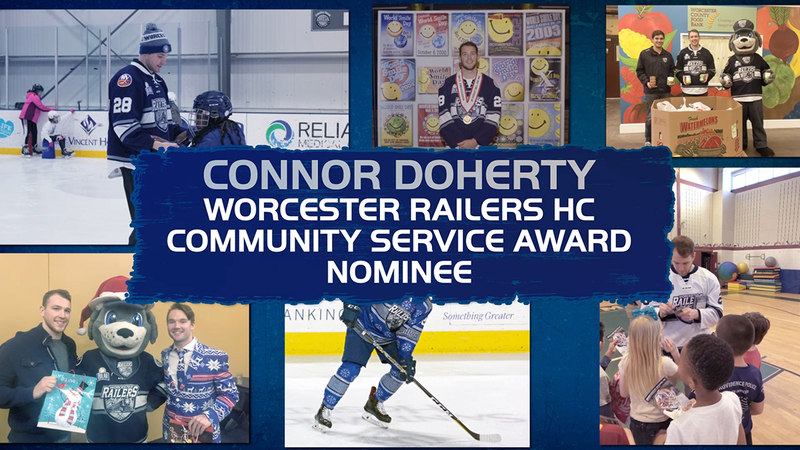 Connor took the lead in helping the Railers make a huge difference in the Worcester community this year. The second-year pro graduated from Sacred Heart University in 2017 and hails from Holden, MA. Doherty was instrumental in participating in learn to skate and reading programs, nonprofit volunteering, event fundraising, library renovations, and booster/fan events. Some notable events that Connor participated in this season include the Friendly House Thanksgiving Food Drive, Adopt A Student Charity Golf Tournament, and the Harvey Ball. The Worcester Railers introduced a new reading program called Ticket To Read earlier this year which Connor led the team in player reading appearances. Doherty made the biggest contribution to the Worcester community through his efforts with the Railers flagship community program Skate to Success which brought over two thousand Worcester Public School fourth grade students to the Fidelity Bank Worcester Ice Center where they were taught to skate by players and coaches, fed lunch from Nonna’s Pizza & Pasta, and received autographed Railers folders with giveaways. Connor quickly became a fan-favorite in Worcester and is always one of the most celebrated players in the high-five tunnel and always approachable at member events. Adirondack’s James Henry was selected as the recipient of the 2018-19 ECHL Community Service Award. For more information about the Railers HC community programs please visit www.RailersHC.com/community.